✔Please read these terms and conditions carefully. By accessing YES website and YES APP thereof you agree to be bound by these terms and conditions. a. (ABX) 1 piece 25kg above or unilateral length 140cm above,extra charges CNY170/Airwaybill and send by Air sensitive method. b. (SKYNET/GDEX/AIRPAK) 1 piece 40kg above or unilateral length 140cm above, extra charges CNY80/Airwaybill and send by Air sensitive method. c.(POSLAJU) NOT ALLOW 1 piece over 30 kg or unilateral length 140cm above by Poslaju, If yes please choose another company for delivery! d.(AIRPAK) Outskirt area delivery extra charges CNY5/kg CAMERON HIGHLANDS 39000-39200 , GENTING HIGHLANDS 69000 , LANGKAWI 07000. b. (AIRPAK) 1 piece 40kg above or unilateral length 140cm above, extra charges CNY80/Airwaybill and send by Air sensitive method. c.Recommend weight is less than 11kg and within UDS100 declare, If exceeds the limit, the Customs will levy TAX. a. 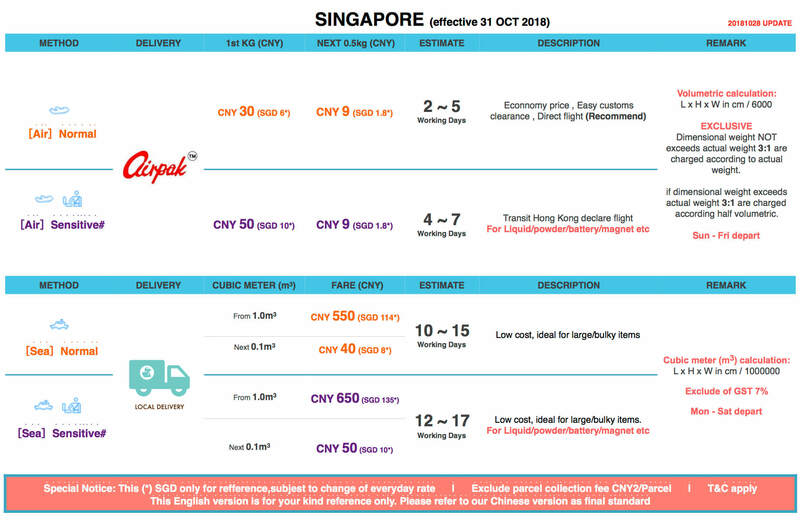 (Airpak) 1 piece 30kg above or unilateral length 140cm above,extra charges CNY250/Airwaybill and send by Air sensitive method. b.Not support delivery to Jurong Island, Jurong Port, military camp, airport, student apartment, hospital, prison. 4.Noted: Base on International Air Transport Association (IATA) standard ,The transport costs for your shipments are calculated on the basis of the total weight of all packages. A decisive factor for calculating the price, however, is whether the dimensional weight exceeds the actual weight*. Malaysia(West) & Malaysia(East) and Singapore area: shipments where dimensional weight NOT exceeds actual weight 3:1 are charged according to actual weight, if dimensional weight exceeds actual weight 3:1 are charged according half volumetric. (a) Please note that the weight written on the seller's website is usually the actual weight. When you buy a product with a large volume or a small density, you need to pay special attention to the volume and actual weight of the comparative product. (b) Commonly used products with large volume over actual weight (BIG SIZE), dolls, bubble paper, suitcases, plastic toys, diapers, pillows, chairs, crystal lamps, bicycles, etc. (c) Sometimes the shipping cost of individual goods will be more expensive than the cost of the goods themselves, so we recommend that you confirm the size with the seller before buying, or contact YES customer service to help you confirm. 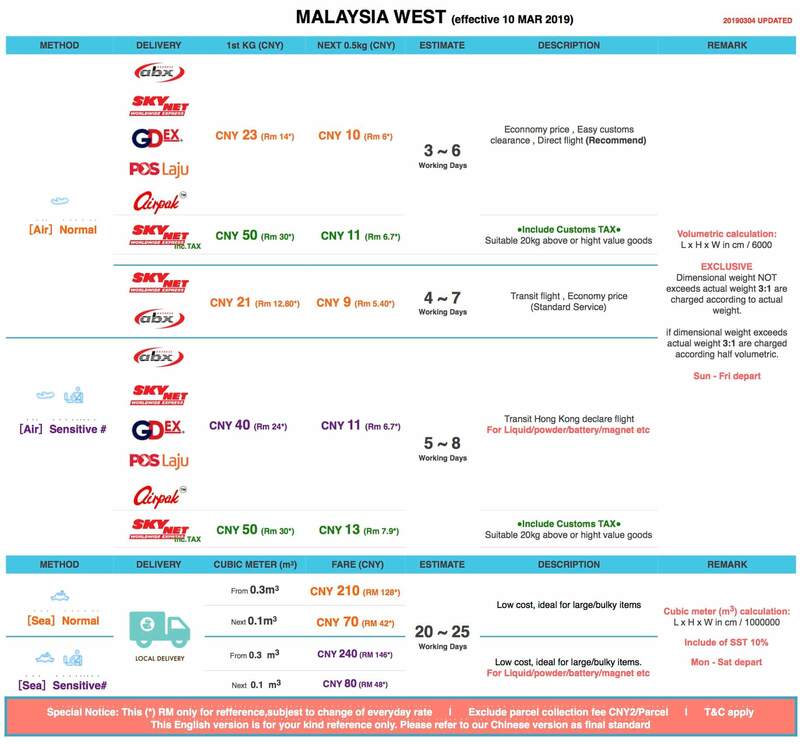 1.MALAYSIA WEST delivery door to door (except island+mountain area) , but Langkawi Island can be arrange transfer to other logistic with extra charge. 3. (1 cubic meter limit weight 500KG) calculation method of overweight: actual weight / 500KG = charges cubic meter. 4.Size length/width/height of more than 2 meters on one side or 1 piece more then 1.5 tons extra charges apply. 5. [Fragile Item] might be damage during shipping procedure.Seller and logistics provider will NOT offer exchange or compensation.Damage occurs at the buyer own risk. 6.Delivery only to the downstairs, not upstairs. 7.False report cargo value may inspected by the customs, the responsibility and expenses incurred shall be borne by the sender. 8.Normal+Sensitive cargo mix together will consider as sensitive cargo. 9.The stacking of goods in the container leads to a small volume pressure. When the goods are received, there may be a unilateral difference of 2-3 cm. 10.Not support delivery to tomilitary camp, airport, student apartment, hospital, prison. 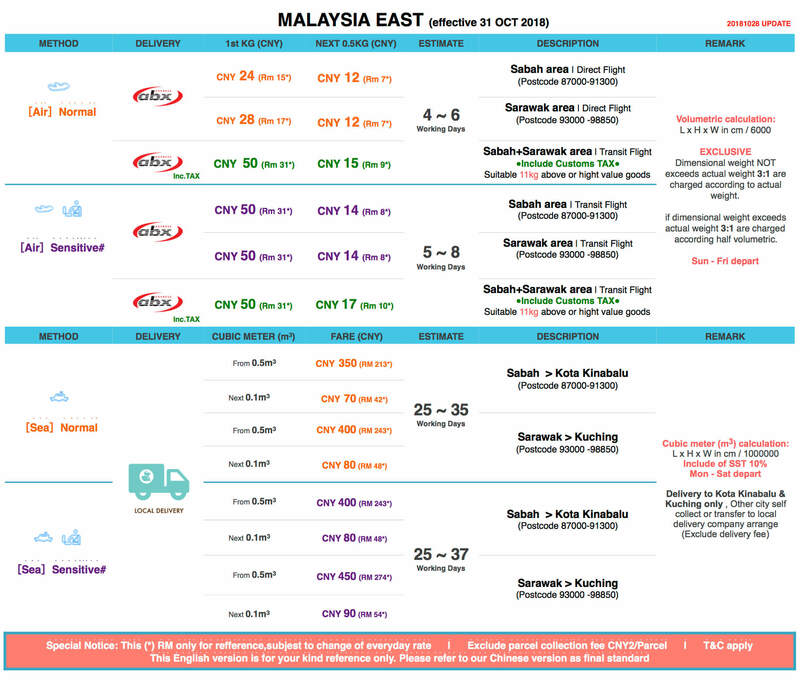 1.Fare is quoted in CNY and includes fuel surcharge, (YES) reserve the right to make irregular adjustment according to market conditions. 2.Fare quotation does not include the destination import tax (except for tax-included method), outskirt area surcharges, fines, warehousing and returning fees caused by the recipient, and the destruction fee. The sender cannot refuse to pay for any reason. a.Delivery Order▶Example:Send 10box but receive 9box must indicate on return delivery Order to driver and take picture to proof. b.Cargo picture▶If packaging damage or lost must take picture and weight before open it. 4.If sensitive item ship by NORMAL cargo method will lead to custom return/penalty charge/Confiscation, occurs at the sender own risk. 5.Rejected Contraband: weapons, animals, currency, flammables, gas (spray), dangerous goods, alcohol, drugs, tobacco etc and all IATA restrictions on items.